It's that time of year again when I try to come up with an original, clever, but easy Valentine idea for my kids' class. The first idea that came to mind was wrapping candy packages like little presents and I went with it. Determined to avoid a $10 run to the craft shop which inevitably turns into a $50 craft run, I corralled some potential supplies from my stash: some leftover gold leaf paper we used to make laurel wreath crowns for my daughter's Greek goddess party, a bag of acrylic gems, clear tape, scissors and my trusty glue gun. On a side note, I bought this glue gun at the hundred yen store in Japan about 10 years ago and it has outlasted a lot of fancy glue guns. 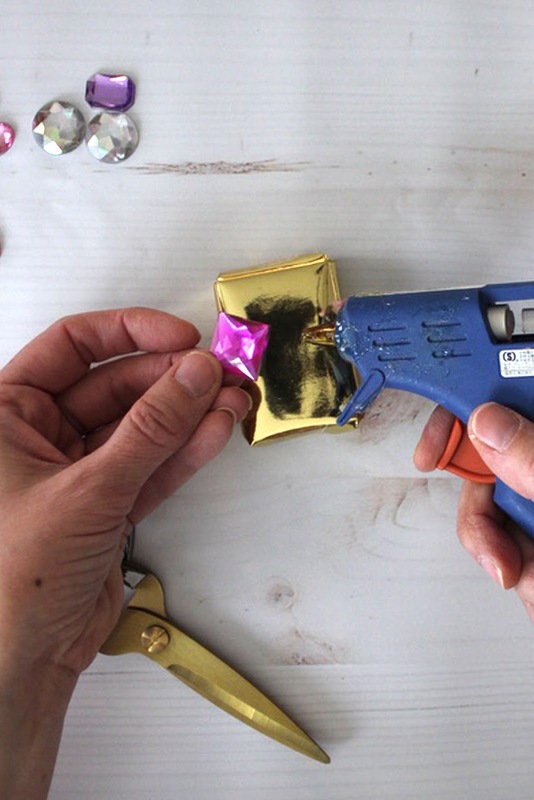 So if you're in the market for a glue gun, look for the simplest version you can find. The more expensive ones always burn out on me. Probably because I always forget to turn them off. Next, I took one of my daughters with me to the drugstore to find candy that we could easily wrap. 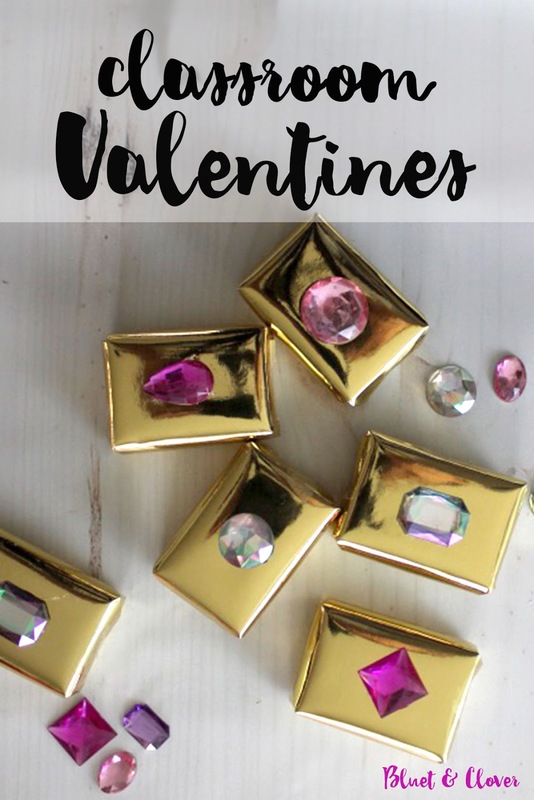 Conversation hearts aren't even in my top 10 favorite candies, but they do come in a box making them perfect for this craft. And, more importantly, my daughter tells me that the kids in her class are always hoping to get these. Win! And in case you were worried that conversation hearts are in short supply, never fear. 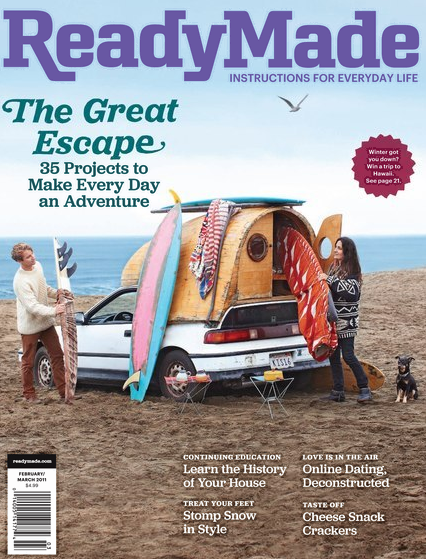 The original makers, Necco, have gone out of business, but Brach and other brands make plenty of them. 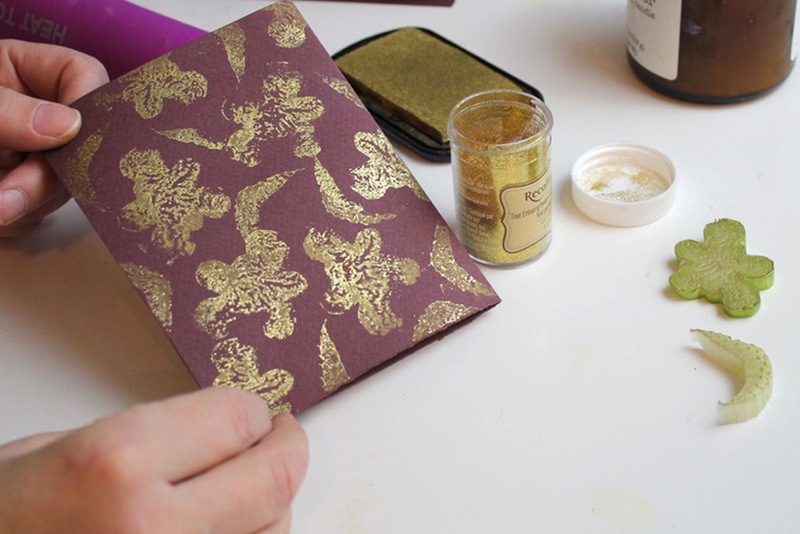 If you go to the craft store to buy gold leaf paper, look for the 8 1/2 x 11 packs. It will be much easier to use as wrapping paper than card stock and less expensive. Even better, usse gold wrapping paper. Step 1) Make sure your child's name is written on the box before you start wrapping. 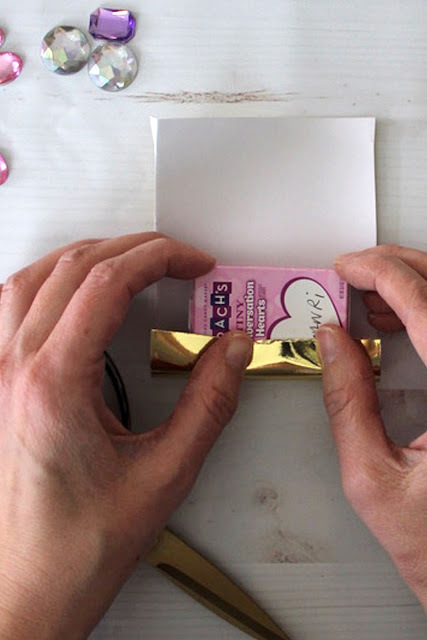 Step 2) Wrap each box of hearts using clear tape. 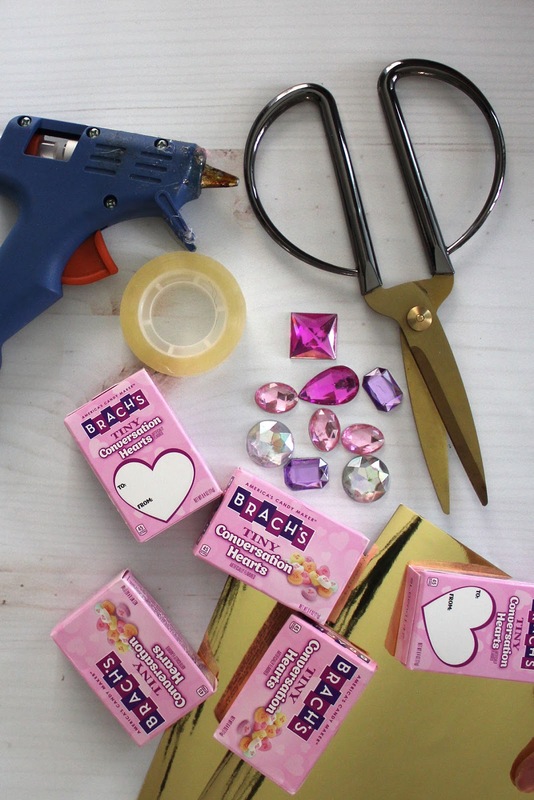 Step 3) Hot glue a gem in the center of the package. I absolutely love how glamorous they look and it only took about 30 minutes to wrap 25 boxes. Compared to some other Valentines I've made with the kids, that's fast. If your kids are going to be making these themselves, I recommend cutting the paper to size first to make it easier. 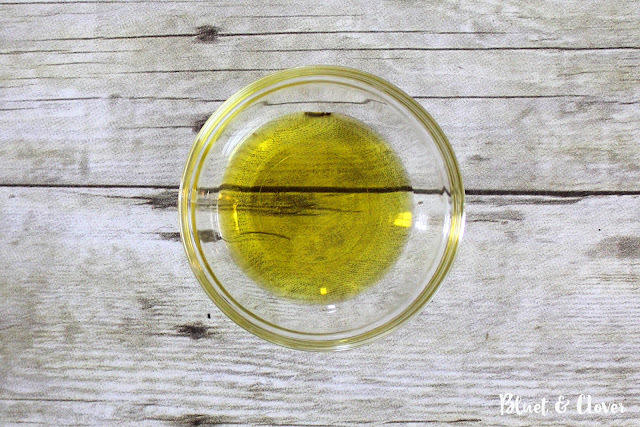 Olive oil isn't just for cooking! 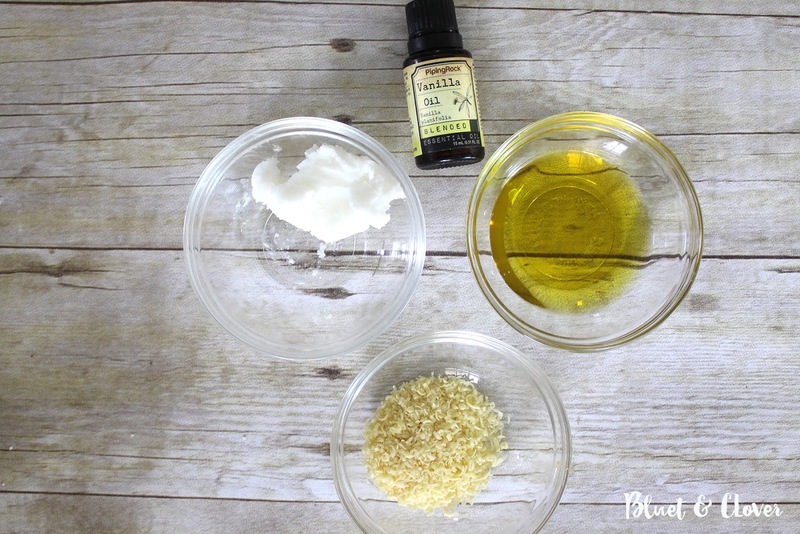 Here are three ways I use it in beauty recipes. First up is a simple one ingredient hand moisturizer. 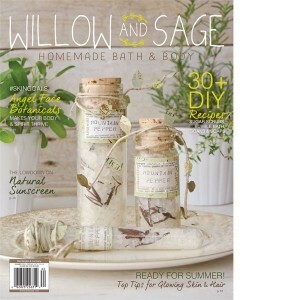 I find myself constantly washing my hands when I'm cooking which really dries out my skin. The last thing I want to add to a salad is store-bought moisturizer. Gross. So I just rub some olive oil directly onto my hands and keep chopping! I don't have to worry about scented moisturizer tainting my food. 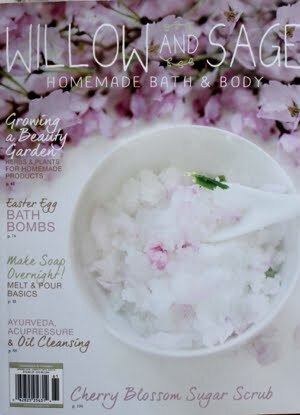 Now for my very favorite foot scrub (store-bought or homemade). Nothing works like this simple 3-ingredient recipe. Just mix a half cup of kosher salt (epsom salt works too) with a quarter cup olive oil. Then add to that a tablespoon of fresh squeezed lemon juice. 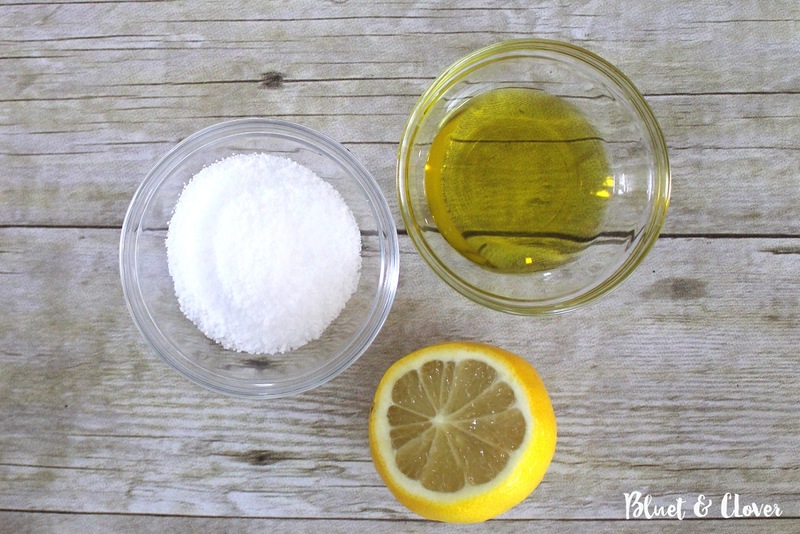 Rub the mixture onto your feet and let it sit for a couple of minutes, then rinse off. Store the scrub in the fridge between uses. Now for a four-ingredient recipe. Put two tablespoons of olive oil and one tablespoon each of grated beeswax and shea butter into a microwave safe bowl. 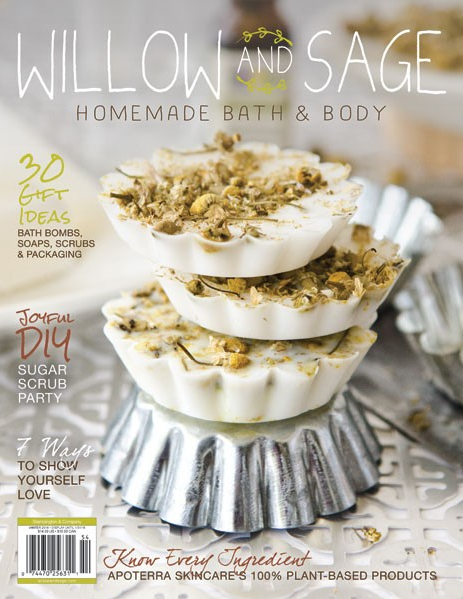 Heat until just melted and add 15 crops of essential oil. I like to use vanilla essential oil. Pour into a clean container and let it harden before using. We've been having a pretty uneventful winter break. The weather is crummy and the car's in the shop which pulled the plug on my plans to go on some day trips. But when the weather outside is frightful and you've no place to go, you get to crafting, right? 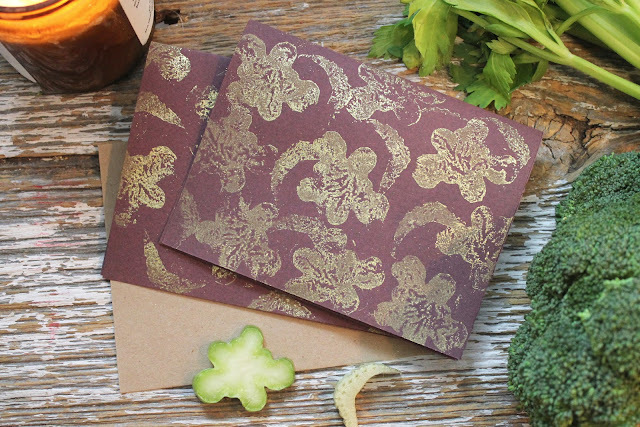 This idea of printing note cards with vegetables has been at the back of my mind for awhile now. 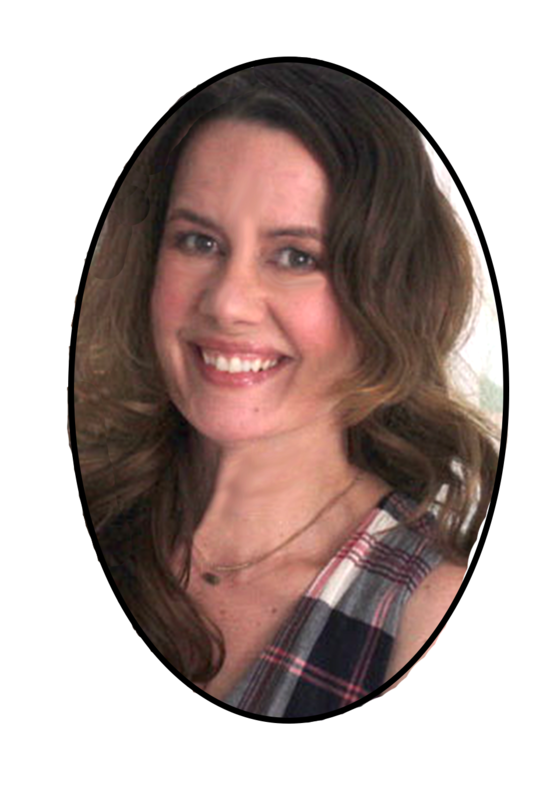 If that sounds strange then you're not spending enough time on Pinterest. Stamping with veggies is nothing new, but it's one of those things I just haven't gotten around to trying. And the kids have their thank you notes to write, so I did what any crafty mom would do. I handed them some broccoli and told them to get started on those thank you cards! After watching them have quite a bit of fun, I decided it was my turn. 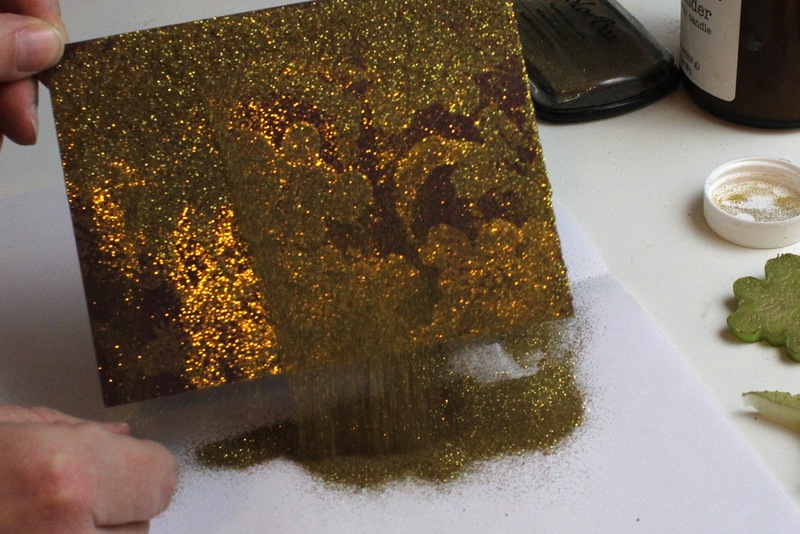 And also time to take things up a notch with some moody burgundy paper and gold ink. How sophisticated! 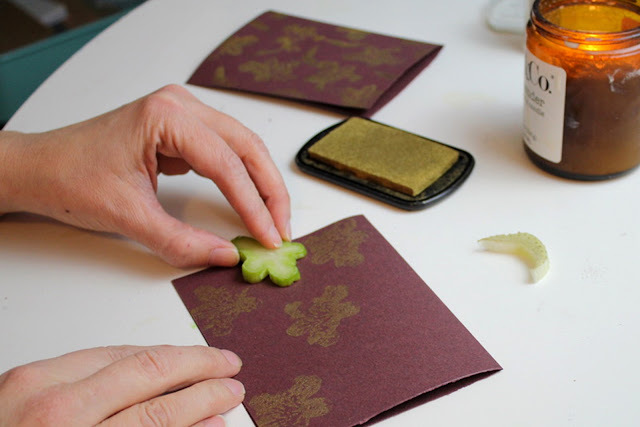 Stamping with vegetables is a very intuitive process. Interesting shapes appear without giving things too much thought. I see flying dragons on one card and hibiscus on another. I'm kind of in love with these cards and this method of just seeing what happens. And just in case you want the step-by-step, it's quite simple. 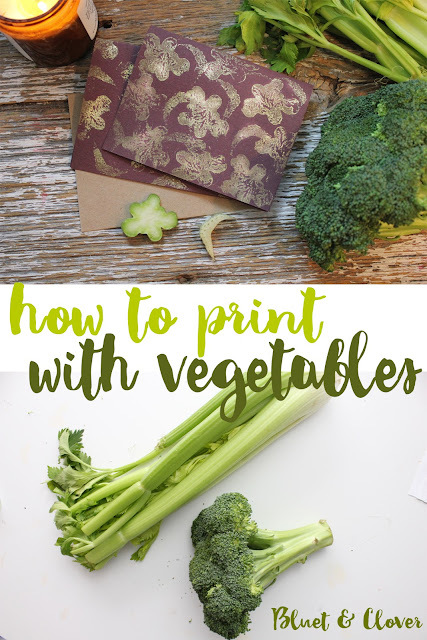 Just cut the ends off some veggies and use them just as you would a rubber stamp. I used broccoli and celery, but you could use potatoes, carrots, chard stalks, or a cob of corn. I had to get just a little fancy and use a pigment based ink which is slow drying and allows you to add some embossing powder. 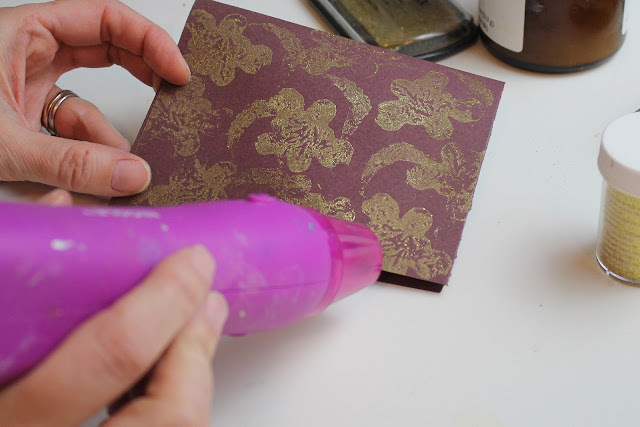 If you take this extra step, you'll need to set the embossing powder with a heat tool. And be sure to pour the embossing powder over a sheet of paper so you can pour the excess back into the container. The paper I used is Canson Mi–Teintes in burgundy. I cut an 8 1/2 x 11" sheet in two and folded each half to make two 4 1/4 x 5 1/2" cards. Oh yes, this was a crafting success. Try it out! Here's to keeping things simple and a very Happy New Year!